By synthesizing a growing body ofwork in search processes that are not driven by explicit objectives, this paper advances the hypothesis that there is a fundamental problem with the dominant paradigm of objective-based search in evolutionary computation and genetic programming: Most ambitious objectives do not illuminate a path to themselves. That is, the gradient of improvement induced by ambitious objectives tends to lead not to the objective itself but instead to deadend local optima. Indirectly supporting this hypothesis, great discoveries often are not the result of objective-driven search. For example, the major inspiration for both evolutionary computation and genetic programming, natural evolution, innovates through an open-ended process that lacks a final objective. Similarly, large-scale cultural evolutionary processes, such as the evolution of technology, mathematics, and art, lack a unified fixed goal. In addition, direct evidence for this hypothesis is presented from a recently-introduced search algorithm called novelty search. Though ignorant of the ultimate objective of search, in many instances novelty search has counter-intuitively outperformed searching directly for the objective, including a wide variety of randomly-generated problems introduced in an experiment in this chapter. Thus a new understanding is beginning to emerge that suggests that searching for a fixed objective, which is the reigning paradigm in evolutionary computation and even machine learning as a whole, may ultimately limit what can be achieved. 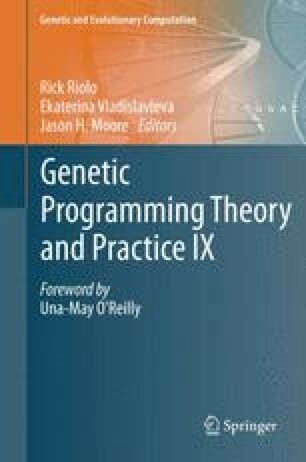 Yet the liberating implication of this hypothesis argued in this paper is that by embracing search processes that are not driven by explicit objectives, the breadth and depth of what is reachable through evolutionary methods such as genetic programming may be greatly expanded.